The market for sports apparel and accessories is a crowded one. Companies jockey for the endorsements of megastar athletes, hoping their seal of approval will bring that coveted buzz and, with it, worldwide brand recognition. But what if, instead of leaning on the big name, a company put their focus on tapping into the strength and resilience each of us carries within ourselves? What if their message was that everyone, everywhere, can impact their world every day by embracing four simple words: Wake Up and Win. Revive, as a project, has been decades in the making. All three partners keyed in on “sacrifice” as the defining word to describe their entrepreneurial journey. 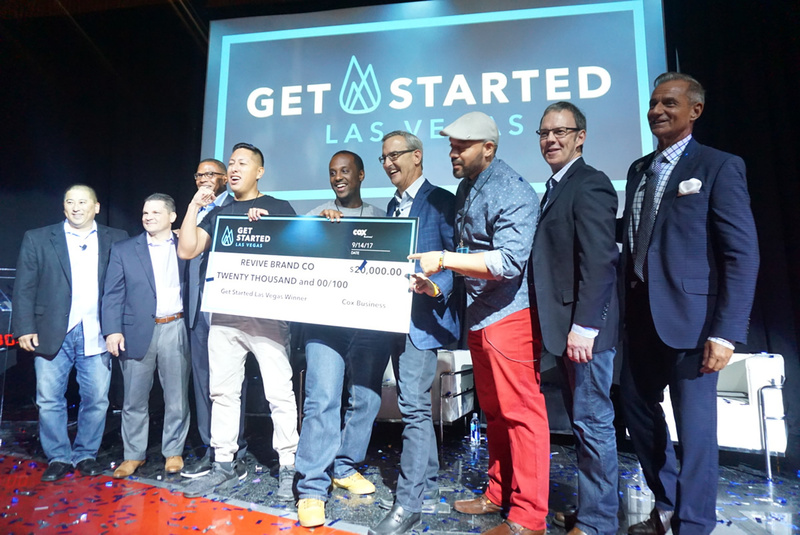 But the energy and focus they brought to their presentation at Cox’s Las Vegas Get Started event impressed the panel enough to send the guys home with the big prize. Jonathan met Medin at the College of Southern Nevada when he was paired with him for a final class project that called for them to develop a business plan. It was a chance to put some real structure to this idea that had been brewing for years, and Medin proved to be a perfect fit with Jonathan and his brother and business partner, Cesar. In the hopes of getting the trio’s dreams off the ground, Cesar stepped in and offered up a possible solution. He had a sewing machine and he figured he would simply teach himself to sew and they would tackle this thing on their own. “He just started taking our drawings and doing some research into how things were created,” Jonathan says. Once they had a functional example of what they wanted, they met with a one-man manufacturing company in California to learn more. “It helped Cesar visualize and actually see the process of creating products—the fabrics, the build, everything,” Jonathan says. The team spent the coming years grinding and pushing to get their products out there. Their focus early on was primarily on sports bags and accessories. Reaching a point of cash-strapped exhaustion, though, they began to feel uncertain about the future of Revive. What would come next would change their lives—and their brand—forever. From the beginning, Revive has had no outside investors. The trio has worked other jobs and taken out small personal loans to build the business, and all the sales they made were fed right back into the company to keep in going. In the midst of a financial rough patch, the guys were also undergoing a bit of an identity crisis. “We’d gotten some sales, and people liked our products, but we’d never had anything that connected with the customer base and really energized them,” Medin says. With years of struggle under their belts, the guys seem to have finally found the path to bring Revive to the place they’d always hoped it could go. Cesar is working around the clock on innovative new designs and Jonathan is mentoring young entrepreneurs and providing them with the guidance to get their own dreams off the ground. All the while, Medin is out in the community, tabling at events and speaking at schools, spreading the message of Wake Up and Win. They’re focused, driven, and ready to take on the world and, ultimately, make it a better place.